Welcome to the town of Brokenwood. A sleepy farming town in the middle of New Zealand where you’d assume that nothing ever happens. But their crime rate is extraordinarily high for such an idyllic spot as barely a week seems to go by without a mysterious death occurring. One such murder brings the experienced Detective Mike Shepherd (Neill Rea) up from the city. An unconventional maverick, he’s partnered with the much younger and much more by-the-book Detective Kristin Sims (Fern Sutherland) and, as might be expected, to begin with they don’t hit it off. But as inexplicable murder follows inexplicable murder, it’s also to be expected that they’ll start to form a bond as Mike adjusts to life in the country, where everybody seems to be connected to everybody else and deep, dark secrets abound …. Brokenwood is a small place. The population seems to be around five thousand, although it’s constantly decreasing (depending on how many people get killed in any given episode). Brokenwood’s bucolic beauty is one of the series’ selling points – no wonder that some have dubbed the show “A New Zealand Midsomer Murders” – whilst the interplay between Mike and Kristin is another obvious plus-point. It’s hardly an original concept for a series. A mismatched partnership – male/female – with very different takes on just about everything. But since the formula works it’s not surprising that it gets repeated again and again. The Brokenwood Mysteries might not bring anything particularly new to the table, but it does what it does very well. It’s always handy to start a new series with an outsider, since they can function as the audience identification figure and we can learn along with them. Mike Shepherd is pitched headlong into the town of Brokenwood in the opening episode – Blood and Water – which sees a local farmer – Nate Dunn (Chris Sherwood) – fished out of the river. Did he commit suicide or was it a case of murder? The parameters of the series are firmly set here – a leisurely running time (90 minutes plus per episode), lashings of country music (Mike’s a firm fan) and a story where long-hidden secrets hold the key to solving the mystery. Neill Rea instantly appeals as Mike Shepherd. Mike is a friendly and slightly rumpled character, easily able to put just about everybody he meets at their ease (a useful skill for a detective). His private life is a bit of a mystery though. There are definitely ex-wives in his past, although exactly how many isn’t known. That he elects to stay in Brokenwood after solving the first case suggests that he had nothing or no-one special to return home to (he’s very much a self-contained person, happy with his own company). He does have passions though – a 1971 car he’s very proud of (although nobody else agrees with him) and a large supply of country music cassettes. He prefers music on cassette and he loves country music because “they’re the best three-minute crime stories ever sung. There’s heartache, adultery, jealousy, divorce, death”. His quirks – he likes to crack inappropriate jokes when inspecting bodies (“too soon?”) as well as conversing with the corpses – ensures that he stands out from the rank and file. His strengths are matched in equal and opposite ways by Kristin Sims (Fern Sutherland). Kristin is everything that Mike isn’t – young, meticulous and computer savvy. Initially she rubs Mike up the wrong way, but it isn’t long before they settle down and form a fairly harmonious working relationship, although Kristin can still sometimes be appalled at Mike’s reluctance to follow procedure. But as time goes by there’s a definite Ying/Yang feel to their relationship as both have positive character traits that the other lacks. Those familiar with the parameters of this type of series should be easily able to spot the upcoming murder victim during the opening minutes of the second episode, Sour Grapes. Brokenwood is an area with a thriving wine industry, so it’s no surprise to learn that the annual wine contest always sparks a great deal of interest. Amanda James’ (Josephine Davison) winery has walked away with the top prize for the last five years, therefore she is appalled when judge Paul Winterson (Alistair Browning) overlooks her this time. The appearance of dead Winterson’s body is a jolting reveal – it comes bobbing to the surface from one of Amanda James’ vast wine vats – and his presence there means that Amanda is a prime suspect. But although The Brokenwood Mysteries has no qualms in embracing predictability at times, with ninety five minutes to fill it’s pretty obvious that the solution isn’t quite as cut and dried as it first appears. The remaining two episodes of the first series – Playing the Lie and Hunting the Stag – maintain the high standard already established. Arresting reveals of the dead or dying is something of a Brokenwood trait and Playing the Lie certainly doesn’t disappoint on this score. The sight of Adele Stone (Roz Turnbull), owner of the Brokenwood Golf Club, lurching towards a group of golfers – her face red and distorted – is certainly something out of the ordinary. Death by poisoning? That’s what Mike and Kristen have to establish. In Hunting the Stag, Hayden Renner (Francis Mountjoy) elects to combine his stag party with the hunt for a real animal, so he and his friends head out into the forest. But bride-to-be Renner never makes it back – he’s shot through the head. At first it appears to be a tragic hunting accident, but since none of his friends will admit to shooting him and all of them discharged their rifles, things turn out to be quite complex. As series one progresses, we begin to learn a little more about the other regulars. Detective Constable Sam Breen (Nic Sampson) is always on hand to do a spot of research or provide some necessary exposition. Playing third banana on a police show isn’t a terribly rewarding job, but Sampson does the best with the material he’s provided with. Pana Hema Taylor has a more interesting role as Jared Morehu. When Mike moves to Brokenwood, Jared becomes his neighbour as well as his drinking buddy and confidant. In his early twenties, Jared has the air of a wide-boy who enjoys skirting around the edges of the law. Possibly it’s a case of opposites attracting, but he and Mike quickly form a bond (there’s a surrogate father/son vibe about them) and Jared sometimes finds himself assisting – totally unofficially, of course – Mike in the odd investigation. Gina Kadinsky (Christina Serban Ionda) is Brokenwood’s idiosyncratic medical examiner whilst Meredith Wilmott (Andi Crown) appears in several episodes. Meredith is the Head of Police Communications as well as being one of Mike’s ex-wives, so there’s inevitable mileage to be found in their personal and professional conflicts. One of the strengths of the series is the way that it hops from different groups and sections of society (winegrowers, rugby teams, etc). The next episode, To Die or Not To Die, maintains this run as Mike and Kristen investigate a mysterious death at the Brokenwood Theatre Society. The back-stabbing world of amateur dramatics is a fertile area for both drama and comedy, making this episode a highlight of series two. Catch of the Day poses yet another baffling mystery. When Jared discovers a severed human hand in a crayfish pot, the team have to consider several questions – who does the hand belong to and are they still alive? This one may feel a little drawn out, but the interplay of the regulars ensures that it still ticks along quite nicely. After that slight dip, series two ends on a strong note with Blood Pink. As we’ve seen, Mike is a big country music fan and is naturally delighted when his favourite singer, Holly Collins (Browwyn Turei), arrives in Brokenwood for a gig. No surprises that she doesn’t make it out alive – which immediately points the finger at her dysfunctional band members – Slim Fingers (Peter Dabue), Waylon Strings (Jordan Maguer) and Jesse James (Colleen Davis). Like other long-form detective dramas – Midsomer Murders, Inspector Morse – the lengthy running time of The Brokenwood Mysteries can be both a blessing and a curse. Whilst it means that the mysteries are given time to unfold, there are also occasions when a less than engaging story can feel like something of a slog. But luckily there’s more hits than misses across these two series, so this isn’t too much of a problem. Both releases include a number of short special features. Series one has two interviews – the first with Neill Rea and Fern Sutherland and the other with head writer Tim Balme whilst series two has a Behind the Scenes featurette. The brief running times of the interviews and featurettes (five minutes each for the interviews, three minutes for the Behind the Scenes feature) means that they obviously can’t go into any great depth, but they do help to place the series in context. Both series also include photo galleries, each running for around a minute. The Brokenwood Mysteries is an engaging series which should definitely appeal to crime fans. Recommended. Series one and two of The Brokenwood Mysteries are released by Acorn Media on the 14th of August 2017. Both series cost £19.99 each. Acorn have announced a mouth-watering series of special features for Dixon of Dock Green – Collection Three, due for release in 2015. Audio Commentary on Domino with actor Stephen Marsh (P.C. Harry Dunne). Audio Commentary on Alice with director Michael E. Briant. The Final Cases: Documentary on the making of this last series, with actors Nicholas Donnelly (Sgt. Johnny Wills), Richard Heffer (D.S. Alan Bruton), Gregory de Polnay (D.S. Mike Brewer) and production assistant Vivienne Cozens. Good Evening All: A tribute to Jack Warner, with Nicholas Donnelly, Richard Heffer, Stephen Marsh, Gregory de Polnay and Vivenne Cozens. Personnel Files: Extended Interviews with Nicholas Donnelly, Richard Heffer and Gregory de Polnay. Acorn have also released a teaser video to further wet the appetite. It can be pre-ordered from Acorn now (for release in early 2015). If it follows the path of previous Acorn releases. then it should stay as an Acorn exclusive for a few months before going on general release. Having the episodes themselves would have justified the purchase price, but this set of special features is more than welcome. More information on collection three can be found here whilst there’s an overview of collection one here. 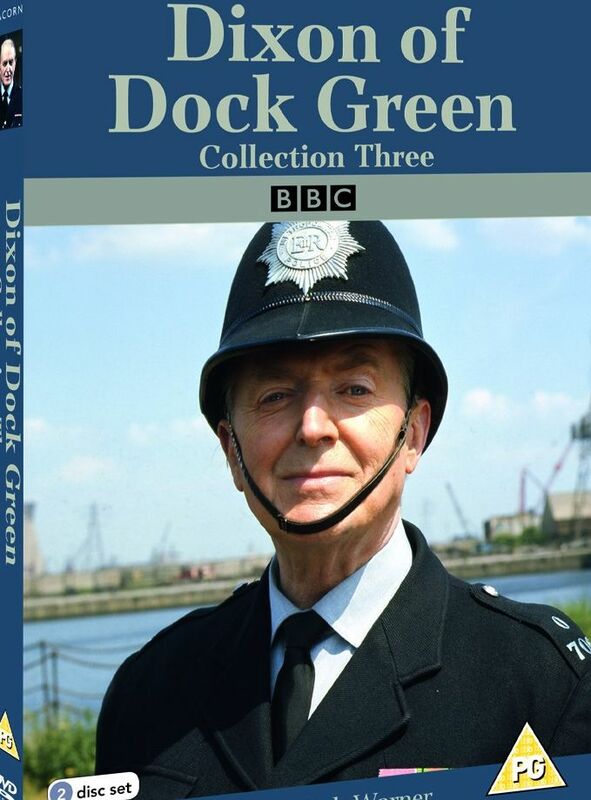 I’m delighted to hear that Acorn will be releasing a third DVD of Dixon of Dock Green episodes. More details can be found on their website here. Collections one and two contained all the existing colour episodes broadcast between 1970 and 1975 (with the exception of Molenzicht which was omitted for unspecified rights reasons). Collection three will have all eight episodes from the 22nd and final series (broadcast in 1976). This is the only series of Dixon of Dock Green to exist in its entirety, which sadly indicates just how depleted the Dixon archive is. 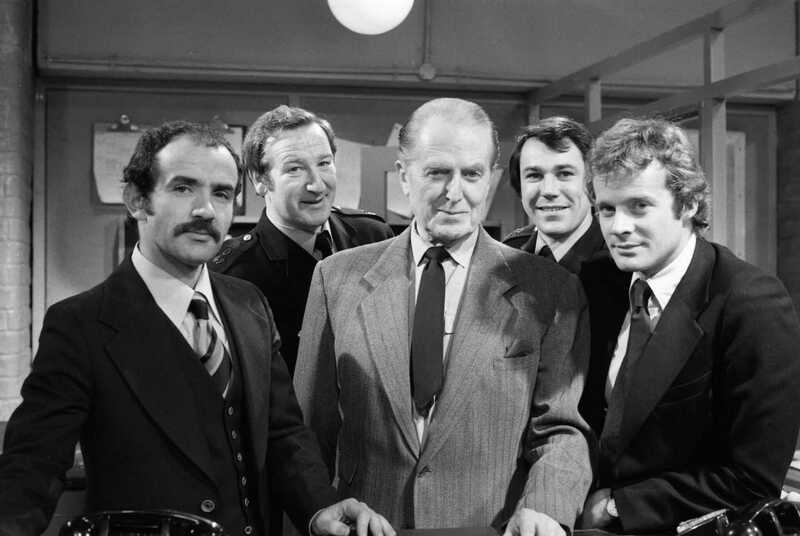 This final series sees George Dixon (Jack Warner) working as a civilian collator at Dock Green police station, following his retirement from the force. Given that Jack Warner was eighty years old at the time, this was a reasonable move (indeed, his obvious age and immobility had been a problem for a few years prior to this). Missing from the final series was Andy Crawford (played by Peter Byrne). As Byrne had been a regular since 1955, his decision not to take part in this series was puzzling – as it was pretty obvious that the series (due to Warner’s age) wouldn’t be continuing for much longer. I’ve written here about my appreciation of the first collection of episodes, released in 2012, and hopefully these final eight will be of a similar standard. This just leaves the black and white episodes which could (maybe if sales of this DVD are good) make up collection four some time in the future.